Will growth continue despite the challenges? Sales of medical and recreational marijuana totaled nearly $3 billion last year in what is one of the nation's fastest-growing industries. Experts say sales could reach $35 billion by 2020 if all 50 states and the District of Columbia legalize the drug. Currently, 23 states and the District of Columbia sanction medical marijuana, and four of those states and the District allow both medical and recreational use. Voters in more states are expected to legalize cannabis in 2016. Yet the industry faces big hurdles. Possession or sale of marijuana remains illegal under federal law, and while the Obama administration has opted not to enforce the law against users in states that have legalized pot, the next president could abandon that policy. 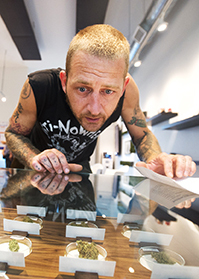 What's more, banks fearful of violating the federal law are refusing to offer financial services to marijuana entrepreneurs, making it difficult for them to expand their businesses and meet soaring public demand. And while legal marijuana is generating millions in state taxes, critics say the social costs, such as marijuana-impaired driving, far outweigh the benefits.